This website is intended solely for educational purposes. Nothing here is intended as medical counseling. 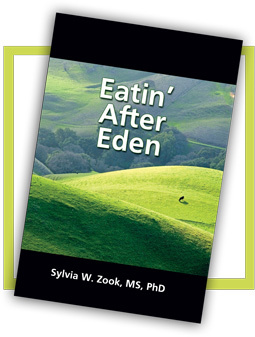 Visitors to this website fully understand that no statement of Sylvia Zook's, or anyone quoted at this website, is meant to discourage anyone from following one's physician's advice. No one should discontinue prescription medications without the advice of same. Nothing at this website suggests or implies that services of medical practitioners be replaced. 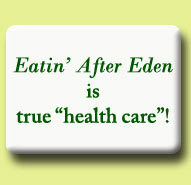 No statement, food, or product mentioned at this website or in the book, Eatin' After Eden, is intended to diagnose, prescribe, treat, prevent, or cure disease. The mention of any resource at this website does not imply or constitute an endorsement, or guarantee of quality by the author. Further, the author specifically disclaims any and all liability for judgments, claims, costs, damages, or injuries from any products or resources mentioned by the author, or offered by any of the sources as mentioned at this website. No recipe or food mentioned at this website is intended for use by those who may have an allergy, sensitivity, or intolerance to such foods. The reader further understands that diet and lifestyle changes should be undertaken in consultation with his or her physician.